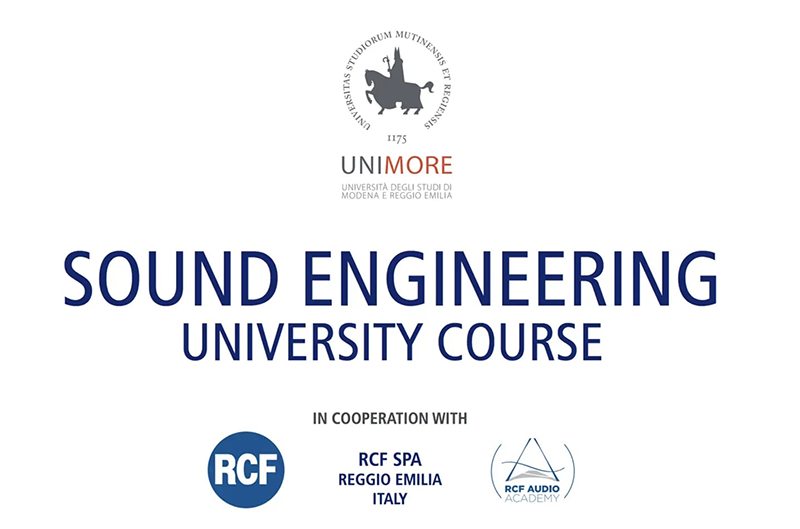 REGGIO EMILIA, Italy – RCF announced it will offer a Sound Engineering course in cooperation with the University of Modena and Reggio Emilia. The primary goal of the course is to provide audio engineers with a specific knowledge of the state-of-the-art technologies related to sound, transducers and speaker systems exploring their applications in the professional market. The course will be taking the participants through a learning process from the basis of electroacoustic components like transducers, amplifiers and digital processors till the design of a complete audio project based on a real case study. An international reference project carried out by RCF engineers will be used as a studying guideline to be followed during the course. The technical contents provided in this University Course will be completed by the direct experience of RCF laboratories. Since 1949 RCF has been involved in the design, manufacturing and market applications of professional loudspeaker products and systems for theaters, concerts, auditoriums, airports, cruise ships, shopping malls, cinemas, stadia and all applications of sound reinforcement. The course will be directed by Professor Emilio Lorenzani, Department of Science and Methods for Engineering, University of Modena and Reggio Emilia. The course will be in e-learning mode for six weeks beginning February 28, 2019 in e-learning mode; and then will require one week presence, from May 20-24, at the RCF Audio Academy in Reggio Emilia, Italy. The course will be taught in English. Enrollment fee is 750 Euro to Unimore. Registration deadline is February 7, 2019. Participation fee will be covered by sponsorship of RCF SpA. Special lodging accommodates will be available to the participants for the period required.